Oktoberfest Brisbane has been voted one of the Top Ten Oktoberfest in the world and I was lucky enough to be invited to the ‘Anzapfen’ (Opening Ceremony). Oktoberfest is a celebration of German/Bavarian culture. Crown Prince Ludwig married Princess Therese of Saxe-Hildburghausen on October 12, 1810 and the citizens of Munich were invited to attend the festivities held on the fields in the front of the city gates to celebrate the royal event. To close the event was horse racing and the decision to repeat the horse races started the tradition of Oktoberfest as we know it. As was mentioned in one of the speeches, Oktoberfest is basically the longest wedding party EVER! During the opening ceremony, MP Newman, Lord Mayor Quirk, and Consul-General of Germany gave speeches and were asked to tap the first keg of beer which indicates the opening of the festivities! 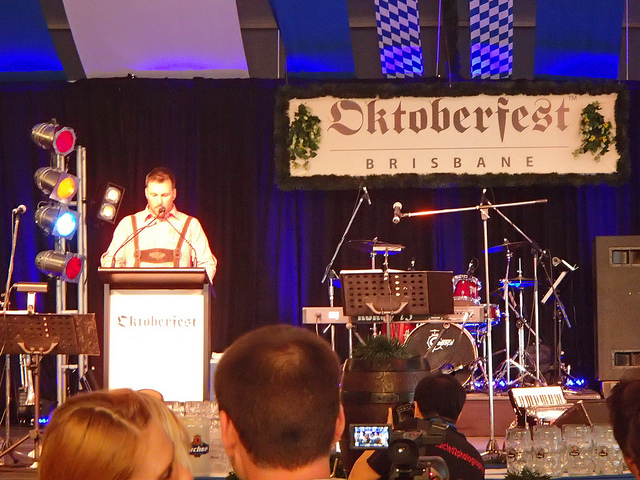 Lord Mayor Quirk handed me my first Oktoberfest beer! Since we were in the VIP area, they gave us heart-shaped necklace cookies, sausages, pretzels, and of course beer (that was brewed in Germany especially for Oktoberfest Brisbane)! Prost! Then, Lyndal Moller (daughter of the founders of the festival) gave us a tour of the site so we could learn more about the history and logistics of the event. She looked so lovely in her beautiful dirndl and many of the men were dressed in lederhosen. Oktoberfest Brisbane runs over two weekend in October where you can sample German food and hand-crafted beers made from 200-year-old recipes, enjoy the awesome German band (major highlight), or participate in the Beardmiester Competition. Nyarai and I attended the Beardmeister Competition and it was awesome. The contestants were really kind and let us take photos with them. Some spent years growing out their beards! That is dedication!! There is a Beard Alliance and Bearded Men of the Sunshine Coast. I thought the winners for Best Natural Moustache, Freestyler, and Best Beard were very deserving. 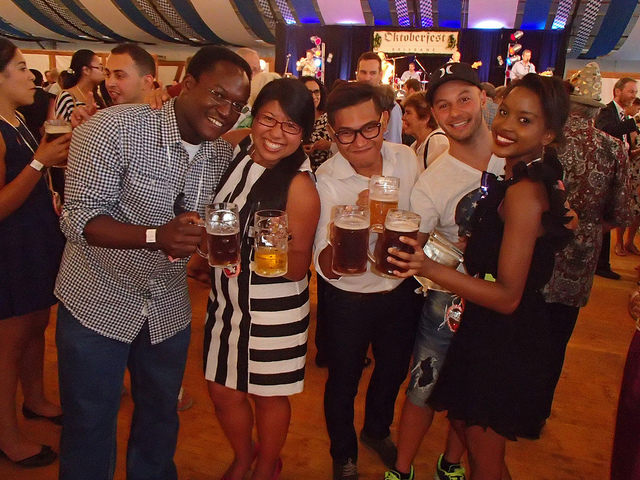 You can be the judge by checking out the rest of my Oktoberfest photos here! Danke!